It was while living in Argentina in the late 1970s that I was first exposed to what it is like to live with high inflation. So it's fitting that I reflect on how inflation works, now that I'm here again and have some time on my hands. During the four years that I spent in Argentina (1975-1979), I think the rate of inflation averaged about 7% a month, or about 125% per year. That's enough inflation to impact your everyday life, and in a big way. My first memory of when the reality of inflation impacted me was the day I collected my first paycheck. I began thinking "what should I do with this money?" It wasn't too long before I realized that keeping the money in my pocket or under the mattress made no sense, since the money was losing value constantly. So my wife and I set off for the nearest warehouse store to buy "stuff" that we could store in the closet. Canned foods and powdered milk for our 1-year old infant ranked high on our list. We scoured the store and found a bunch of stuff, but we couldn't find any milk. I thought that was curious, because it was very popular (Leche Nido, by Nestle). But just then I opened a door to an adjacent storage room and saw boxes of powdered milk stacked to the rafters. So I asked the girl at the cash register if someone could fetch us a couple of boxes. "I'm sorry, sir," she replied. "The milk is not for sale." That's when it dawned on me that everyone was thinking like I was: nobody wanted money, everyone wanted stuff instead. For the next several years I would juggle money balances between pesos and dollars and "stuff." When I saw something for sale that I needed and the price looked reasonable, I would buy it immediately, because I learned that if you waited to look for it in another store, the price could go up. During one episode of very high inflation, grocery stores would post prices on chalkboards, and change them throughout the day. It was a daily struggle to survive, because salaries and wages always went up after the prices for "stuff" went up; incomes lagged prices. Years later I would study the situation in Argentina during the time we lived here, and understand what was happening. In a nutshell, since the government was unable to finance its deficit by selling bonds, it simply ordered the central bank to print up a bunch of new currency in order to pay its bills (that's the same thing that's been going on here in recent years, as I noted last week). New bills flooded the country like Monopoly money. Money became like a hot potato that nobody wanted to hold. Better to change my peso salary to dollars at the beginning of the month, and then convert back to pesos when I needed to buy something. Better to save money by buying stuff than to save money in the bank. Since very few people back then had bank accounts, newly-minted bills just kept accumulating in the economy and losing their value. A $1 million peso note issued in 1978 was initially worth several thousand dollars, but by the mid-1980s, that same note was worth only 20 cents and was withdrawn from circulation. Bottom line, the supply of pesos was growing rapidly at the same time that the demand for pesos was falling. This resulted in a huge increase in money velocity; the ratio of money to nominal GDP fell sharply for years and years. A 50% increase in the money supply could support a 70 or 80% rise in prices. The government would periodically try to slow the rate of inflation by limiting money growth to a rate lower than the prevailing rate of inflation, but it never worked because the velocity of money just kept increasing. More and more people held their money balances in dollars instead of in pesos, and spent their pesos as fast as they could. The government was essentially financing its deficit via an inflation tax: as long as you were holding pesos in your hands, they were losing value and you were effectively paying money to the government. So everyone naturally tried to avoid holding pesos. It was a vicious circle, as rising inflation destroyed confidence and the demand for money, and that in turn fueled higher inflation. Fortunately, the U.S. is extremely unlikely to experience an Argentine-style inflation, for several reasons. For one, the federal deficit is easily financed by selling bonds, so deficits do not result in an unwanted increase in cash. Two, you can't flood the U.S. economy with newly-minted bills, because nobody uses much currency these days. If I were to receive $5000 in cash for whatever reason, I would just take it to the bank. Unwanted cash money returned to banks would be turned over the the Fed, where it would disappear in exchange for bank reserves credited to banks' accounts at the Fed. Three, there is no real alternative for most Americans to holding dollars (bitcoin might be someday, but not for a long time). But this is not to say that the U.S. can't suffer from rising inflation. Inflation in Argentina was aggravated by a significant decline in the demand for money. But in the U.S., the dominant monetary development of the past seven years has been a significant increase in the demand for money. Argentines wanted to minimize their peso holdings, but U.S. consumers (and many consumers around the world as well) have been actively building up their holdings of dollars. 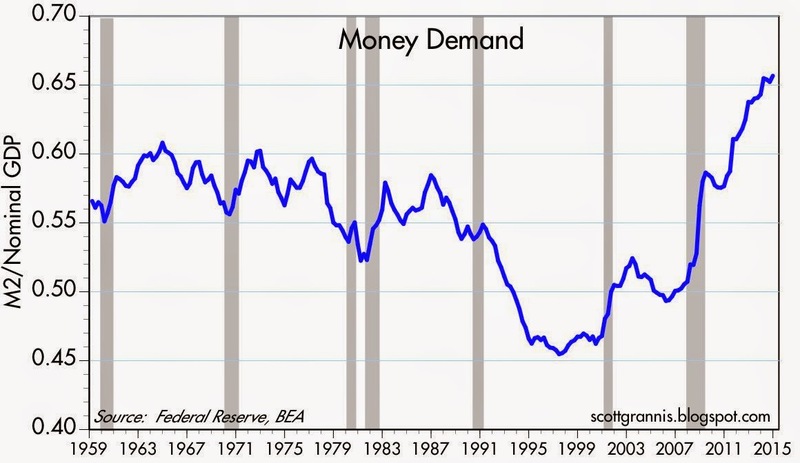 The demand for dollar money has been very strong, so an increase in the dollar money supply has not been inflationary. Inflation has actually been quite low, thanks to very strong money demand. As the chart above shows, the ratio of M2 to nominal GDP has increased by about 30% since the Great Recession. It was a traumatic event for the entire world, and it triggered a huge and unprecedented increase in the demand for money. But note: money demand growth has slowed significantly in the past year or so. 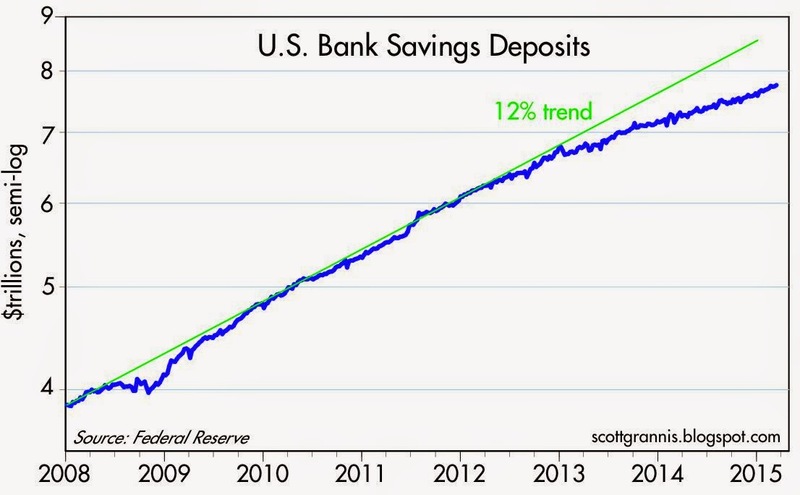 Bank savings deposits, shown in the chart above, have almost doubled in the past seven years—accounting for most of the increase in M2—despite the fact that interest rates on savings deposits are almost nil. Deposits have surged because the public wants to hold more money. Banks pay almost nothing for those deposits because the demand for them is intense. But note in the chart that deposits were growing at a 12% rate for almost 5 years, and the rate of increase has slowed to about 7% in the past year or two. The demand for increased money balances is less strong these days. The trauma of the Great Recession has faded, and confidence is returning. The potential source of higher inflation in the U.S. can be found in the charts above. The huge increase in money demand since the Great Recession has resulted in the public accumulating huge stores of cash and cash equivalents relative to annual income. This money did not fuel inflation because the public wanted to hold it. But should there come a time when the demand for those cash balances starts to decline, that's when inflation pressures could start to build. Meanwhile, there is growing evidence that the demand for money is indeed beginning to decline on the margin. 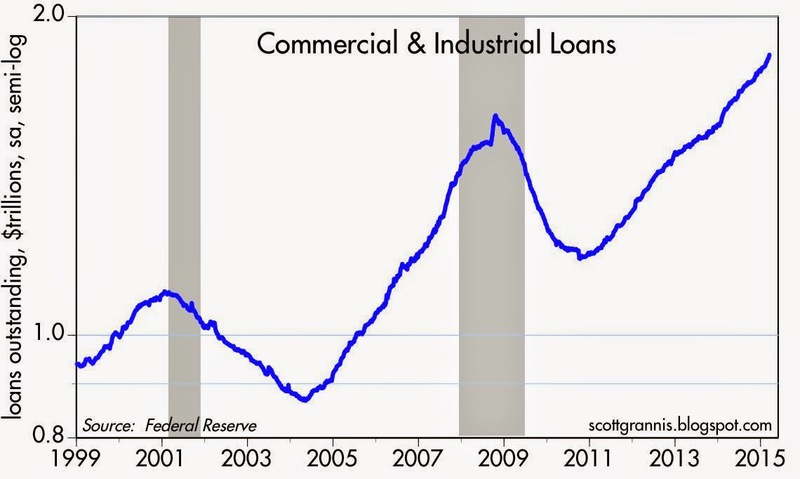 Since the beginning of last year, bank lending has picked up noticeably. This not only reflects improved confidence (banks more willing to lend, businesses and consumers more willing to borrow), but also—importantly—a decline in the demand for money. This may be counter-intuitive, so think of it like this: When you are very confident about the future the last thing you would think to do would be to increase your money balances. You only increase your holdings of money when you become uncertain about the future. When you want to hold more money (e.g., cash, cash equivalents, money market funds, T-bills—things that don't change in value and are highly liquid) you don't want to have more loans; you want to pay down loans and generally deleverage. When your desire to hold money drops, then you want to borrow more and leverage up; (i.e., borrow more money). As the chart above shows, bank lending to small and medium-sized businesses has been expanding at double-digit rates for the past year or so. C&I Loans are up at a 15.6% annualized rate in the past three months, and they are up at a 12-13% annualized rate since the beginning of last year. Increased demand for loans, and increased lending, are signs of increased confidence and a decline in the demand for money. That's very important, because the Fed has ensured, via its massive provision of bank reserves, that there is absolutely no shortage of money in the banking system; banks have a virtually unlimited ability to make loans and create money, if they choose to do so. If the Fed doesn't take appropriate measures to bolster the demand for bank reserves (by increasing the interest rate it pays on reserves) and the demand for money in general (since there is so much of it out there right now), we could find ourselves in a world where the supply of money exceeds the demand for it, and that is what could fuel a rise in inflation. I've said it before and I'll say it again: The return of confidence is the Fed's worst nightmare. In Japan, there is the equivalent of about $7500 dollars in circulation for every resident. They have deflation. Fighting inflation may be yesteryear's game for developed nations. That certainly seems the case in Japan, Europe and possibly the United States. Inflation will only pick up when velocity picks up. Velocity will pick up only when animal spirits pick up. So far, this hasn't happened to nearly the degree that a reasonable person would start to worry about significant inflation. And even if it did, the Fed has an unusually powerful lever to tamp it down - the rate it pays on excess reserves. I'm far more worried about a stagnant-but-still-slightly positive economy for a very long time. And this would be based on loose monetary policy, blah animal spirits, lousy but stable fiscal policy. In such a world, corporate margins stay high, competition gets choked (as new business formation continues to stagnate and corporations remain tight with capex dollars), corporate incumbents do quite well. We continue to slide toward corporate-style fascism. What Scott is describing is a turning point in the US economy!! Confidence results in a desire to borrow to buy or invest or renovate - to take risks which most folks have not wanted to do for the past 5 - 6 years. Meanwhile, the US Federal Reserve has announce its plans to gradually raise interest rates. These are major changes compared to what we experienced from 2009 through 2013. Thus the the slow GDP growth, stagnation, low inflation, etc. are unlikely to continue. Something else to consider: the extremely low interest / borrowing cost have resulted in excesses in various ares. I have said before that the low interest rates which, a few years ago, most folk thought would result in increased consumption and inflation, resulted instead in increased supply of most raw materials and the building of excess capacity for production especially in Asia - which geared up to meet Chinese growth of 10% GDP growth forever. Prediction: the excesses brought about by the unprecedented, extremely low interest rates will be the root cause of the next challenge for global economies. For example, there has been so much low interest rate money available for venture capital that the returns are now poor on that asset class. The key to the future is understanding where the excesses produced by extremely low interest rates are hidden. Those areas of investment which initially prospered due to the available low interest loans are the very areas which will have severe problems going forward. How about the $ 7.5 trillion borrow by corporations to buy back their stock, pay dividends, and for M&A. Will that work out well when the FED raised interest rates (slowly, they say) or inflation begins to increase (slowly, they say). Excess leads to a counter reaction. The world is always changing and what one thinks they know to be true today probably won't hold true for tomorrow. But I take exception in one regard: that US monetary policy is loose. If monetary policy is so loose, why do we have almost zero inflation in unit labor costs for the last 6 years? Maybe I am arguing semantics, but I think US monetary policy has been tight. Post Scriptum: I can recall the numerous posts on this Blog from 2009 - 2011 predicting spiraling national debt, inflation and a falling dollar. To be honest, I also thought those were a real risk. But we were ALL WRONG. An example of "common wisdom" or group think. Six years later none of that is true. Thus, one must be skeptical of one's current beliefs which largely reflect what has happened the past three years: slow global economic growth, slow but steady US growth with continuing high corporate profit margins, and some risk of deflation. Just about the time that 95% of folks hold the same economic beliefs to be true, something different occurs. I suspect that today's "common wisdom" - like so frequently in the past - will disappoint again. Benjamin: Very fair point. You're absolutely correct to point out that US monetary policy, has, if anything, been too tight during the last one and three years. In fact, it feeds my greater fear of, not inflation, but a decreased commitment to alleviating a lack of animal spirits. I was too loose in my words describing the Fed! Restating: Since the great crisis, I think the Fed has been pretty good. Not great, but pretty good. The last couple years further bolster this opinion. My sense going forward is that monetary policy will be ok. If this whole grand experiment doesn't work out so well, my best guess is that we'll be pointing to poor fiscal policy, not poor monetary policy. (This is a weightier statement for me than it might seem given my aversion to a fiat currency system.) And I think at this stage, it is poor fiscal policy that is the biggest reason behind the lack of animal spirits that manifest themselves in the incredibly low velocity figures we're seeing. You're absolutely right to call me out on that "loose monetary policy" phrase. William: I think your comments on this thread are quite wise. I am wrestling with the very issues you raise, as we all are. My struggle is one of timing, as it so often is. But I agree wholeheartedly with the general issues you raise, that consensus is becoming a little too engrained and that we should be looking for the fallout of the bubble-icious elements. "If the Fed doesn't take appropriate measures "
The Fed has been doing it with its consistently increasing regulation on the big banks, CCAR getting more and more difficult each year. The banks have to comply with ever increasing capital ratios. William: I really do take to heart the sentiments you expressed in your latest comments. But in re-reading them, I have to ask: Ok, I'm alert, I'm aware, I'm looking for evidence of the very issues you raise and I find myself copacetic with the overall gist. But what now? I wonder myself. I think passive investing might be less rewarding going forward. Equites, bonds , property fully priced. Buy a run-down quadplex, dude it up. Take an equity stake in a small company along with a salaried management position, if you think you can boost profits. There is no right to profits through passive investing, or active for that matter. But I suspect active will be a better path--plus, after you have enhanced an asset, there will be a pretty penny paid for it by an overloaded passive investor. In the practical world, real estate is often a good path for active investing. Thanks for the great insight and lesson from your experience in Argentina Scott. I'll never experience that and you did an excellent job describing as well as having us think a lot more clearer about not only Argentina's situation but our own here in USA! If you're searching for the ultimate Bitcoin exchange company, then you should go with CoinMama.